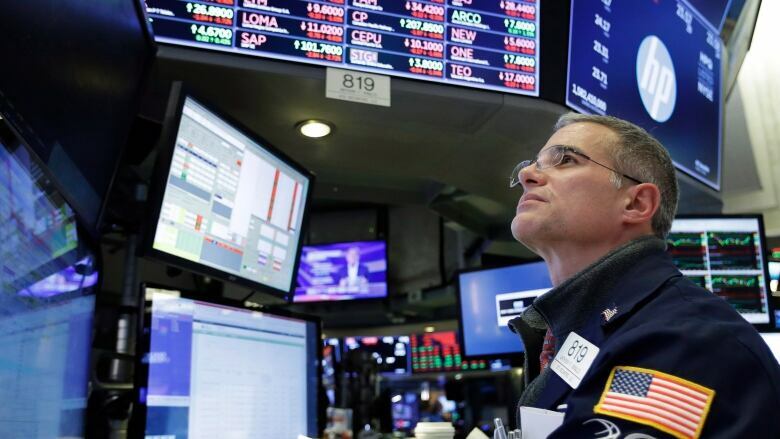 Oil prices tumbled another 6.6 per cent as Wall Street reacted to rising oil supplies and concerns that global economic growth will slow down, a worry that's intensified because of the trade tensions between the U.S. and China. The S&P 500 index lost 48.84 points, or 1.8 per cent, to 2,641.89. The Dow Jones Industrial Average sank 551.80 points, or 2.2 per cent, to 24,465.64. The tech-heavy Nasdaq composite lost 119.65 points, or 1.7 per cent, to 6,908.82. The Russell 2000 index of smaller-company stocks shed 27.53 points, or 1.8 per cent, to 1,469.01. The Dow Jones Industrial Average has lost 3.7 per cent in the past two days, and the S&P 500 is off 3.4 per cent. The Nasdaq, heavily populated with technology stocks, is off 4.7 per cent. The S&P 500 index has fallen 9.9 per cent from the record high it set exactly two months ago. Canada's main stock index also suffered a triple-digit decline as the drop in oil prices pushed the TSX down more than eight per cent in 2018. The S&P/TSX composite index closed down 194.01 points, or 1.3 per cent, at 14,877.00. Investors are measuring a number of headwinds and increasingly playing it safe. The global economy is showing signs of weakening, with the United States, China and Europe all facing the rising threat of a slowdown, which can hurt demand for commodities such as oil and pose a threat to company profits. Trade tensions between the U.S. and China appear to be getting worse instead of improving, contributing to the sell-off in tech stocks and multinational industrial companies. For much of this year, investors were hopeful the U.S. and China would easily resolve their differences on trade. That hope has faded in the last two months. While U.S. President Donald Trump and China President Xi Jinping are expected to meet this month at a gathering of the Group of 20 major economies, the proposed limits on tech exports were one more reason to worry. "A resolution doesn't seem to be coming in the short term," said Katie Nixon, the chief investment officer for Northern Trust Wealth Management. "A lot of the companies that are front and centre [like] Alphabet, Apple, IBM ... could be significantly limited in the way they export their technology." Apple fell 4.8 per cent to $176.98 US and is down 23.7 per cent from the peak it reached October 3, though it's still up almost 5 per cent this year. Microsoft lost 2.8 per cent to $101.71 US and IBM fell 2.6 per cent to $117.20 US. The price of oil has been falling sharply in recent weeks and is now down 30 per cent since Oct. 3. Saudi Arabia and other countries started producing more oil after the Trump administration announced renewed sanctions on Iran, Nixon noted. The administration granted waivers to several countries allowing them to continue importing oil from Iran, creating a supply glut that pushed prices dramatically lower. Earnings from retailers didn't help investors' mood. Target plunged skidded 10.5 per cent to $69.03 US after reporting earnings that missed Wall Street's estimates due to higher expenses. Ross Stores, TJX and Kohl's also fell on disappointing forecasts. Tech stocks were among the biggest losers in Europe, too. Nokia and Ericsson, two top suppliers of telecom networks, each fell about 3 per cent. European indexes fell, with Germany's DAX index dropping 1.6 per cent and the French CAC 30 falling 1.2 per cent. Britain's FTSE 100 lost 0.8 per cent. Stocks also declined in Asia. 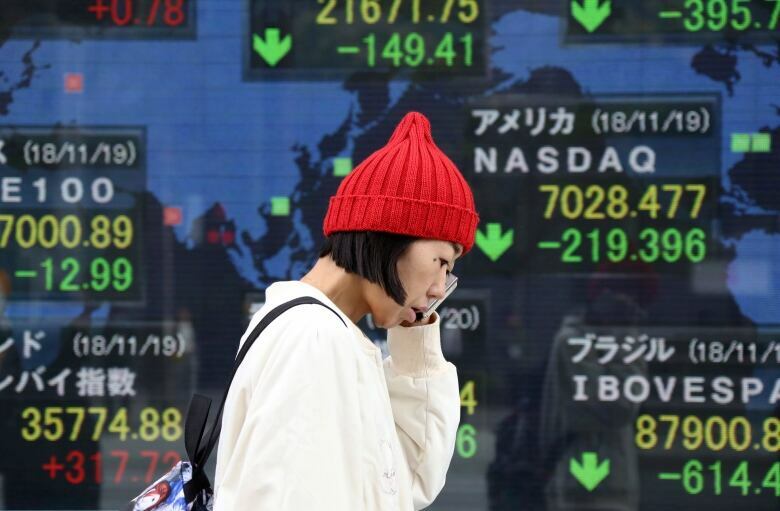 Japan's Nikkei 225 lost 1.1 per cent and Hong Kong's Hang Seng shed 2 per cent. Benchmark U.S. crude lost 6.6 per cent to $53.43 US a barrel in New York. Brent crude, used to price international oils, fell 6.4 per cent to $62.53 US per barrel in London. Oil prices have nosedived since early October. Wholesale gasoline fell 5.5 per cent to $1.50 US a gallon and heating oil skidded 4.6 per cent to $1.99 US a gallon. Natural gas dipped 3.8 per cent to $4.52 US per 1,000 cubic feet. Bond prices were steady. The yield on the 10-year Treasury note remained at 3.06 per cent. Gold slipped 0.3 per cent to $1,221.20 US an ounce. Silver fell 0.9 per cent to $14.27 US an ounce. Copper slid 1.2 per cent to $2.77 US a pound. The dollar fell to 112.40 yen from 112.54 yen. The euro fell to $1.1399 US from $1.1453 US.